Even without looking to the sales figures it’s obvious the Hyundai i30, Mazda 3 and Toyota Corolla are all the rage; and for good reason. The three cars assembled here are not just popular for popularity’s sake. They’re reliable, safe, stylish, incredibly well-equipped, and have been continually improved over many years to earn their place at the top of the sales charts. Officially, these small hatches rule the roost when it comes to Australian new car sales. In order it’s the Toyota Corolla that sits in first place with 21,737 sales year-to-date – which interestingly enough is a number composed mostly of the outgoing model and not the new version tested here — with the Mazda 3 in second place with 19,533 sales and the Hyundai i30 in third with 17,158. It’s also worth noting at this point that if you were to add the sales of the sedan version of the i30, the Hyundai Elantra, to those figures, the ‘i30’ would have amassed 19,809 sales overall, which would rank it as Australia’s second-most-popular passenger car. But that’s a story for another day. We also thought it important to include a hybrid-powered model in the mix for this test. It’s an option Hyundai and Mazda do not yet offer in the Australian market, and one we feel may persuade environmentally conscious buyers within the strong-selling small car segment. In short, we’re comparing the Hyundai i30, Mazda 3 and Toyota Corolla because they’re the best of the best. More than that, we wanted to see how the new Corolla, launched just last month (August), compares to its contemporaries. The assortment gathered here compares what we believe are the best-selling variants of each model in the eyes of private buyers. These aren’t the rental and fleet specials that make up the majority of the sales numbers listed above, but the ones you and I would be most likely to purchase with our own money – and we’ll talk more about that in ‘How much do they cost?’ shortly. On test is the 2.0-litre petrol-powered Hyundai i30 Elite (120kW/203Nm) with a six-speed automatic transmission, the 2.5-litre petrol-powered Mazda 3 SP25 GT (138kW/250Nm), also with a six-speed automatic transmission, and the all-new 1.8-litre petrol-electric Toyota Corolla ZR Hybrid (72kW/142Nm and 90kW combined system power), with a continuously variable transmission and mechanical launch-gear combination. All run comfortably on regular 91 RON unleaded petrol, have four-cylinder engines, are front-wheel drive, feature electrically assisted steering and are stopped by disc brakes on all four wheels. Importantly, they all also include autonomous emergency braking as standard equipment. Safety is well covered in all three variants, with the Hyundai i30 and Mazda 3 receiving five-star ANCAP crash ratings in 2017 and 2016 respectively (find out why the year a car receives its crash rating is important here). The Toyota Corolla scored a five-star result just days before this comparison was completed – more information is available here. As we’ve noted already, the variants of Australia’s most-popular small cars on test are the ones private buyers like you and I are more likely to shell out our hard-earned cash for. Beyond the good-but-basic entry models, the more highly specified variants on test offer the bells and whistles that are more likely to be used and appreciated each and every day. And while the ‘small car’ label might still technically apply to the Hyundai i30, Mazda 3, Toyota Corolla and its ilk, it is something of a misnomer. The dimensions alone align the three more closely with ‘family cars’ of only a few decades ago, the cleverly utilised cabin space extracting usable seating for four adults (five at a pinch) and cargo compartments that in some cases would shame a few older mid-sized sedans. With the rear seats in place it’s the Hyundai i30 that offers the most cargo space at 395 litres. The Corolla comes second with 333 litres but – and this is important – that figure only applies to the top-spec ZR variants and their ‘sportier’ raked tailgate. All other Corolla hatch models offer just 217 litres, while the Mazda3 offers the smallest cargo area on this particular test at 308 litres. Of course a hatch wouldn’t be a hatch without the flexibility of becoming a useful load lugger. To that extent, all three of the models on test are equipped with 60:40 split-fold rear seats which on average expand the available carrying space to 1300 litres, give or take. We pushed, prodded and folded the seats in all three models and found it’s the i30 that offers the most generous use of space here, easily swallowing a cardboard box big enough to carry a dishwasher home from the store. The i30’s cargo bay offers four light-duty plastic tie-down points suitable only for the included parcel net where the Corolla has four sturdy metal anchor points. Hyundai includes two small shopping bag hooks while Toyota has a 2kg ‘hanger’ from the under-side of the parcel shelf. The Mazda3 has neither tie-down points nor shopping bag hooks in its boot. The other great thing about cars like these is the broad appeal they have with buyers from a massive cross-section of the community. Old or young, male or female, single or taken, with kids or without and rich or poor (it’s almost like small-car wedding vows, eh? ), there’s almost no one for whom a small car doesn’t hold some appeal – and that’s especially evident when you look at the price range of the models gathered for this test. Okay, at this point you could be forgiven for thinking that you could walk into a dealer and buy any three of these cars and be happy… and that’s more or less true. In fact, irrespective of the outcome of this comparison, we’d have no compunction recommending any of the three cars on test. But – and there is a ‘but’ – there is a sizeable difference in the cost of ownership of the Hyundai i30, Mazda 3 and Toyota Corolla, and we think that’s important in the longer term. First though, we’ll take a quick look at the range to see where the models tested fit. For Hyundai, the i30 range starts with the i30 Go at $19,990 and tops out at $39,990 for the fire-breathing i30 N hot hatch, while the i30 Elite on test costs $27,790 (plus on-road costs). Mazda’s Mazda3 range starts with the Neo at $20,490 and ends with the SP25 Astina at $35,490. The Mazda 3 SP25 GT here is priced at $31,990 (plus ORCs). Mazda doesn’t offer a hot hatch, and neither does Toyota, whose Corolla range begins the dearest point of all at $22,870 in Ascent Sport guise, and tops out at $31,870 (plus ORCs) for the ZR Hybrid tested here. Metallic paint is $495 on the Hyundai and $550 on the Toyota. Mazda includes metallic paint as standard for all hues except Soul Red and Machine Grey, which attract a $300 premium. Bargain. Warranty provisions are strongest at Hyundai with a five-year/unlimited-kilometre deal that includes roadside assistance and lifetime capped-price servicing. Mazda now also offers a five-year/unlimited-kilometre deal but does not include a capped-price servicing scheme per se (up-to-date service pricing is instead advised on-line). Likewise, roadside assistance is not part of the bargain, instead costing an additional $99 per year. Toyota offers a paltry three-year/100,000km warranty and charges for its roadside assistance plan. But it does offer capped-price servicing as part of its bundled ‘Service Advantage’ scheme – a cost option whose terms and conditions we strongly recommend investigating at the Toyota website. Service intervals for the Hyundai are set at 12 months or 15,000km (whichever comes first) whereas Mazda is 12 months or 10,000km. Like Hyundai, Toyota sets a 12-month or 15,000km service interval and charges a nominal amount of $175 per service, specifically over a five-year or 75,000km duration. On paper fuel economy obviously rates the Corolla Hybrid as the most efficient here at 4.2L/100km on the ADR Combined cycle. The Mazda3 SP25 GT is listed at 6.1L/100km by the same measure, while the i30 Elite is said to use 7.4L/100km. Real-world testing showed numbers of 5.6, 8.1 and 7.6L/100km respectively over a mix of urban and freeway driving. Come trade-in time, it’s the Mazda3 that holds first place retaining 55.3 per cent of its new-car value after three years. 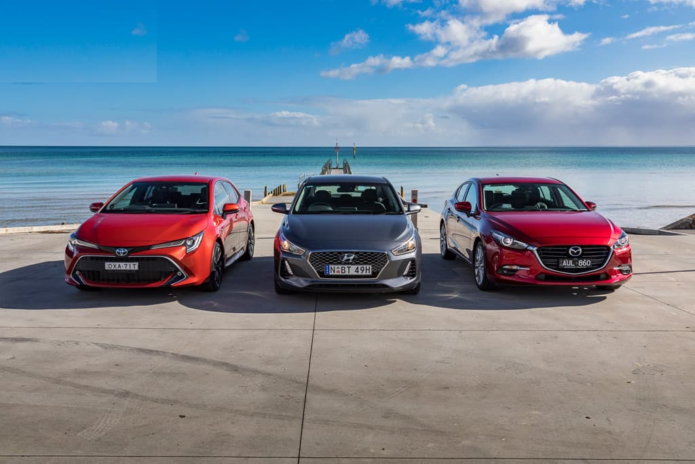 Surprisingly, the Hyundai i30 ranks second with 50.1 per cent and the Toyota Corolla third at 49.7 per cent (figures courtesy of redbook.com.au). Considering the $4000 difference in price between the cheaper Hyundai i30 and dearer Mazda 3 and Toyota Corolla the variance in equipment is rather intriguing – not all manufacturers think alike, it seems. On the infotainment front we find wireless (or inductive) mobile phone charging in the i30 and Corolla, and Bluetooth audio streaming and telephony, satellite navigation and digital radio on all three. Licence-saving Apple CarPlay and Android Auto connectivity is offered only in the Hyundai i30 irrespective of grade, while premium JBL audio is exclusive to Toyota. Comfort and convenience features see dual-zone climate control offered in all of the small hatches assembled, though the Mazda3 omits rear-seat ventilation outlets, and the Hyundai i30 heated front seats. In the grades tested, only the Mazda3 features electric adjustment for the driver’s pew. Hyundai and Mazda offer leatherette upholstery in the model grades tested where the Corolla offers classy suede-effect cloth trim on heavily bolstered sports seats. Assistance levels for the driver vary between the three cars on test, though auto headlights and wipers, blind-spot monitoring, lane-departure warning, keyless entry and ignition, reversing camera and a self-dimming (electro-chromatic) rear-view mirror are common. The i30 and Corolla add adaptive cruise control, lane-keep assist and reversing sensors to the deal while the Mazda3 and Corolla share head-up display – the latter a full-colour system projected onto the windscreen. All the small hatches on test include an electronic park brake, the i30 and Corolla’s adding an auto hold function for pedal-free stops at the lights. We find alloy wheels standard across the board: 17-inch diameter for the Hyundai and 18-inch on the Mazda and Toyota. Hyundai fits Hankook Ventus Prime 2 rubber in 225/45 sizing to the i30 Elite, while Mazda and Toyota shoe the Mazda3 and Corolla with Dunlop tyres – Sport Maxx TT in 215/45 profile for the Mazda3 and Sport Maxx SP in 225/40 section on the Corolla. Only the Hyundai offers a full-size spare wheel, the others come with a space-saver (or temporary spare wheel). The difference in at-the-wheel performance between the three cars on test isn’t night and day, but it’s a closer comparison on-road than the specifications might have you believe. Around town the Hyundai i30 feels livelier than the Mazda3, its off-the-mark acceleration and willingness to select the right ratio in cut-and-thrust traffic appreciably more decisive. Despite 18kW and 47Nm in the Mazda3’s favour the i30’s initial throttle response and a smooth transmission action is of real benefit to urban driving, the i30 only really showing its deficit when faced with steep grades or urgent overtaking manoeuvres. It was a similar story behind the wheel of the Toyota. Around town the Corolla felt cooperative and impressively fluid. The switch between petrol and electric power was imperceptible for the most part while the ability to coast at freeway speeds (with the petrol engine off) improved fuel economy significantly. The CVT makes up for the lack of thrust on offer under the bonnet and although the Corolla wasn’t as lively in highway running and steep grades as the other contenders on test, it’s urban performance is more than adequate. But there were contrasts in our trio that we feel buyers are more likely to notice. For starters the road noise between the three saw the i30 take the lead, the Corolla disappointingly noisy at freeway speeds with considerable tyre noise from the front axle. The Mazda3 slotted between the i30 and Corolla in this regard, sharing second place in terms of steering feedback and communication, too. It’s the Goldilocks situation for our three contenders. None are bad, and none race-car sharp – as you’d no doubt expect. But when faced with a variety of road surfaces and driving environs it’s the Hyundai i30 that’s the pick of the three, its localised suspension tune providing not only communicative feedback to the driver, but a confidence-inspiring ride/handling combination we found hard to look past. Being free of fault in a short period of time is important when assessing cars back-to-back. The Corolla had a few grinding noises from the steering column when parking which raised an eyebrow from our judges. It’s a small issue, no doubt, but it was the only real ‘defect’ noted from the three cars on test. More than that, however, was the value equation of the three cars on test – and we don’t just mean the equipment-for-dollar ratio at the time of purchase. Factor in on-road security, ride comfort, quietness, performance, real-world fuel economy, service and warranty considerations, interior packaging and amenity and it’s the Hyundai i30 that wins by a nose. Simply the i30 Elite is the complete package. It mightn’t have the wow-factor and fuel economy of the Corolla ZR Hybrid or the open-road performance and style of the Mazda3 SP25 GT, but it’s a terrific all-rounder that shows you don’t have to spend a lot of money to get yourself a capable, well-equipped and popular small hatch. How much does the 2018 Hyundai i30 Elite cost? How much does the 2018 Mazda 3 SP25 GT cost? How much does the 2018 Toyota Corolla ZR Hybrid cost?